Bad weather or other disasters can strike any time of year. Around these parts, the most dangerous weather events occur from early spring through late summer. In the past twenty years or so, we have had tornadoes, hurricanes, micro bursts, flooding events and so on. All of that got me thinking about what would happen if a tower came down, or a transmitter building was destroyed by fire, wind, water, etc. 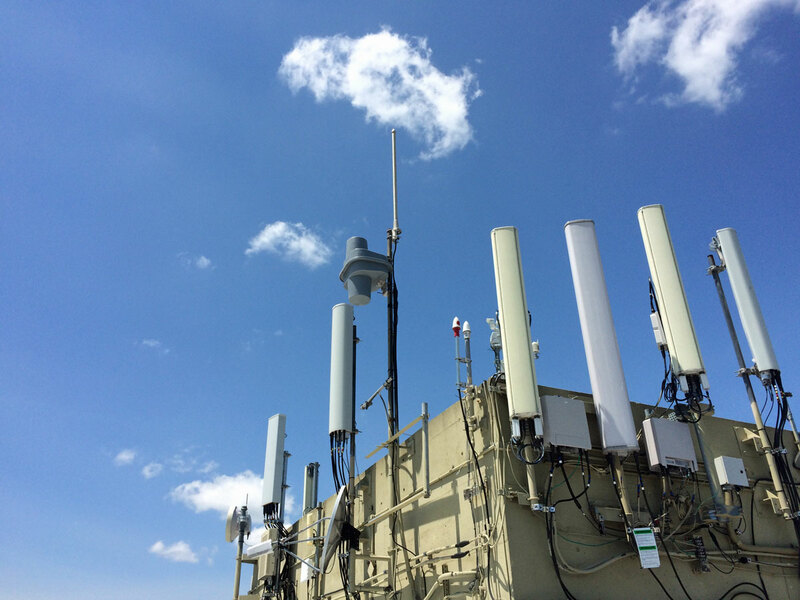 If past events can predict future performance, there would ensue a mad scramble to replace damaged equipment and or get some type of temporary antenna into service. That is what happened in great City of North Adams, Massachusetts when the tower that held the cell carriers, the 911 dispatch, and the local FM radio station came down in an ice storm. Fortunately, we had a single bay Shively antenna at the shop that we trimmed up and installed on a temporary pole with 200 watts TPO. What if there where an event that was so devastating that the electrical power would not be restored for months? Think about hurricane Maria in Puerto Rico. After that event, the infrastructure was so devastated that there was not even the possibility of getting a fuel truck to deliver diesel for the emergency generators at the hospital in San Juan. It can happen. With that in mind, I began poking around and thinking about how I would get something back on the air. In the face of massive disasters, AM and FM radio is still the most effective way to communicate with the general public. Radios are still ubiquitous in homes, cars and businesses. In a short period of time I came up with a couple of solutions. 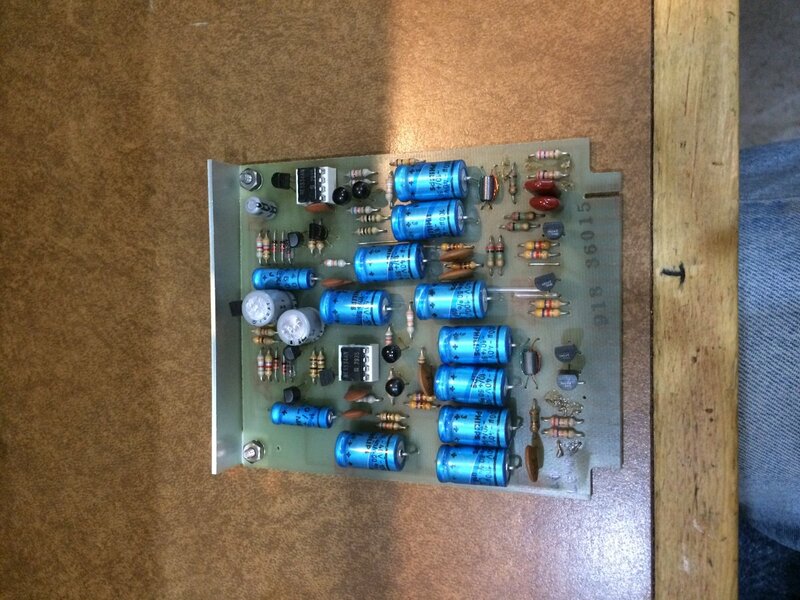 First, the frequency agile Bext exciter uses a single solid state rectifier feeding 24 volts to the power supply board. The audio input includes a mono balanced line level input which can be fed by a computer sound card or some other simple source. From there +12, +15 and +20 VDC are created to run various circuits. 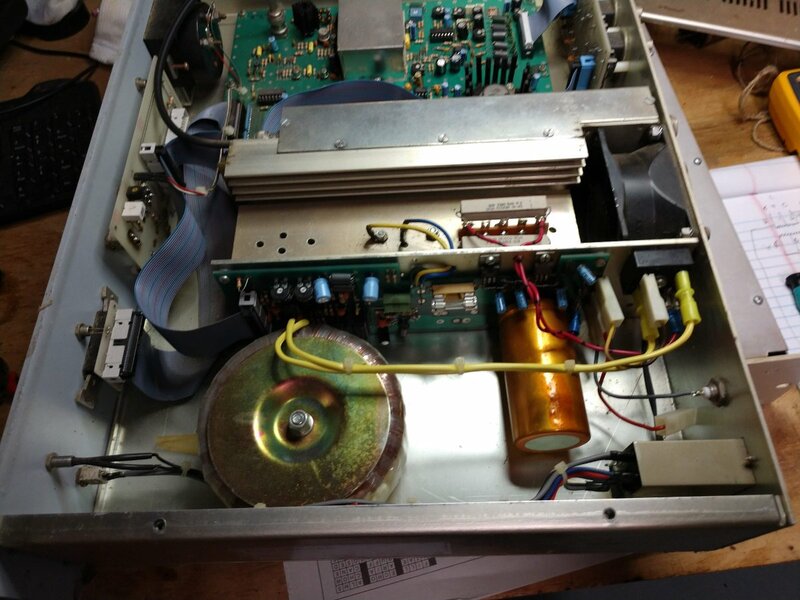 The heat sink cooling fan is the only thing that runs on 120 VAC, which is old and I might replace with a 24 VDC unit. The power output is about 22 watts, which is not bad. That will certainly get out well enough from a high spot and provide good coverage when the power is out because all the other in band RF noise generators will be off. Then I though about the deep cycle batteries in my barn. These 6 volt, 435 Ah units have been around for a couple of years, but last I checked, they still held a charge. 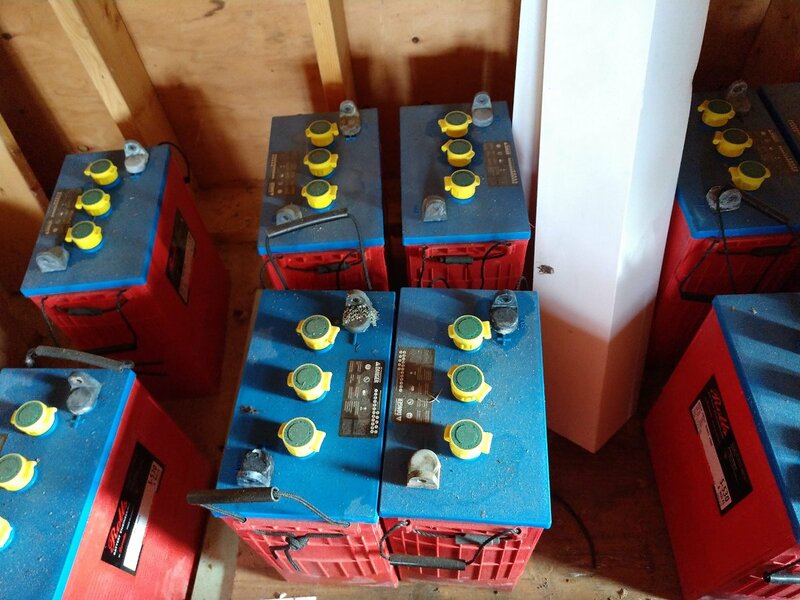 Other deep cycle batteries from things like golf carts, fork lifts, campers, boats etc could also be pressed into service. The point is, 24 VDC should not be impossible to create. This setup would require some sort of 24 volt DC charge controller, which I found on Amazon for less than $15.00 US. This charge controller has selectable 24/12 VDC output and also has two USB ports which would be handy for charging hand held devices. I measured the power draw while the exciter was running 20 watts into a dummy load, it draws 120 Watts. The final part would be some sort of antenna with transmission line. For this situation, a simple wire center fed dipole hung vertically would work well. 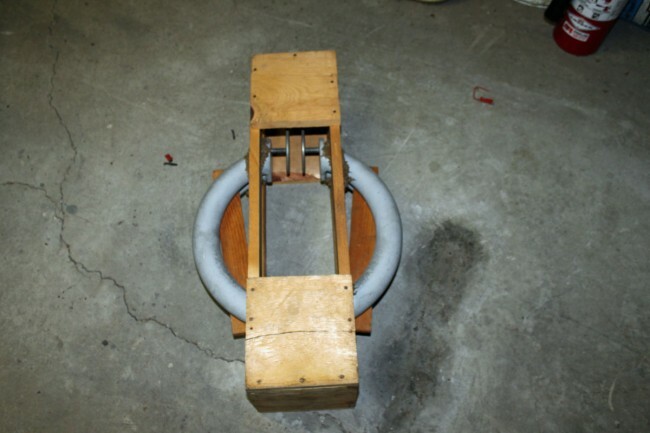 This can be fabricated with two pieces of copper wire and a few insulators. 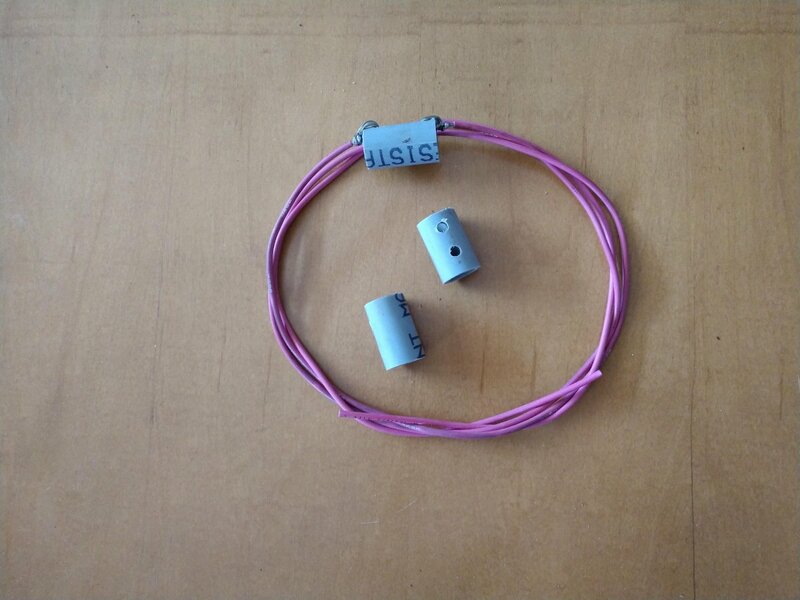 For the FM band, maximum length of wires needed will be 32 inches (81 cm). 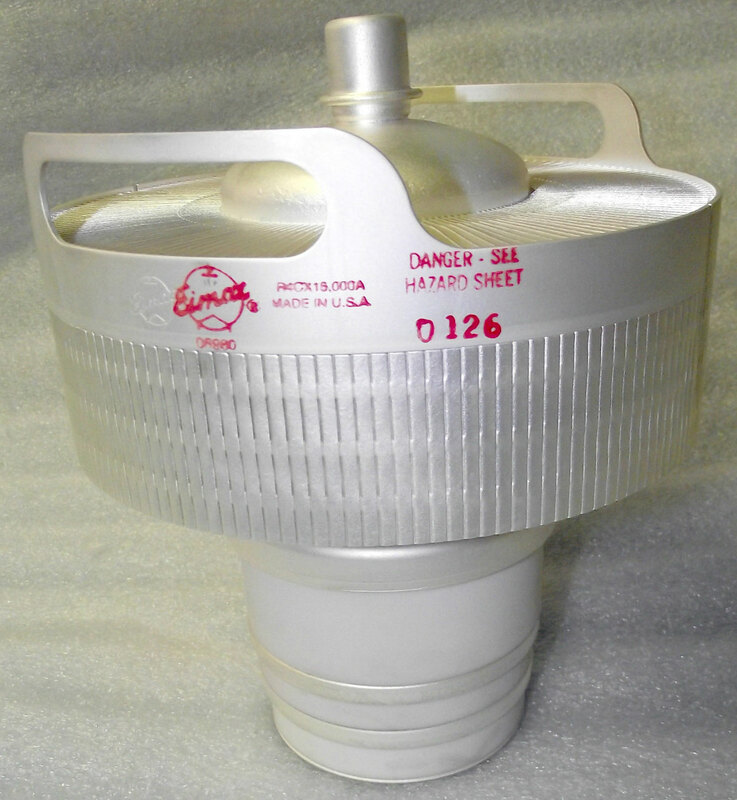 Insulators can be made of anything that does not conduct RF; PVC, ABS, dry wood, dry poly rope, etc. I recommend to cut the wires slightly long, then trim little bits off of each end while watching the reflected power meter on the exciter. To keep RF from coming back down the shield of the transmission line, make 8-10 turns, 6-8 inches in diameter of coax as close to the antenna as possible and secure with a wire tie. This will create a balun of sorts. This is all kept in a sturdy plastic storage bin from the Home Depot. 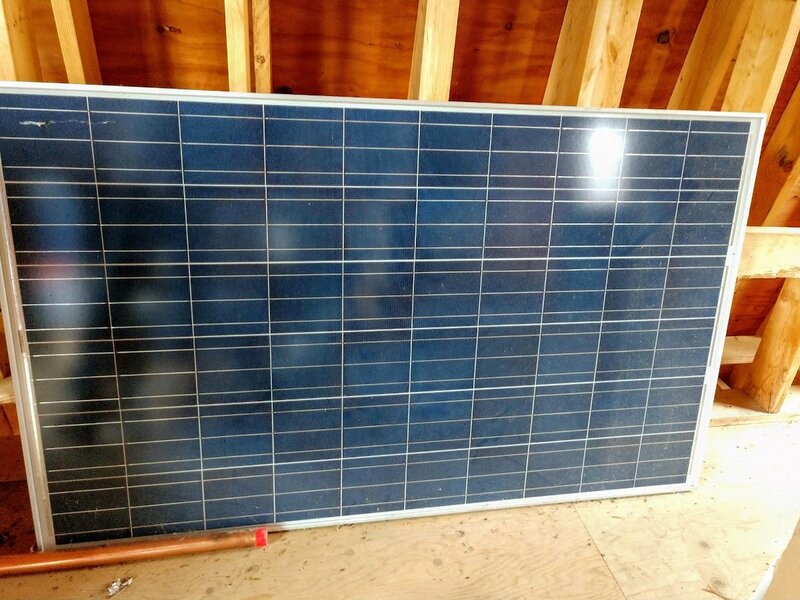 If needed, the batteries and solar panel are stored in the barn along with an assortment of other goodies. Will it ever be needed? Well, I hope not. However, it is much better to be prepared to restore services than wait for somebody to show up and help. Sitting around complaining about the government does not relieve those people in need during and after a disaster. According to my calculations, that is 151,691 hours or 17 years 3 months and 22 days. 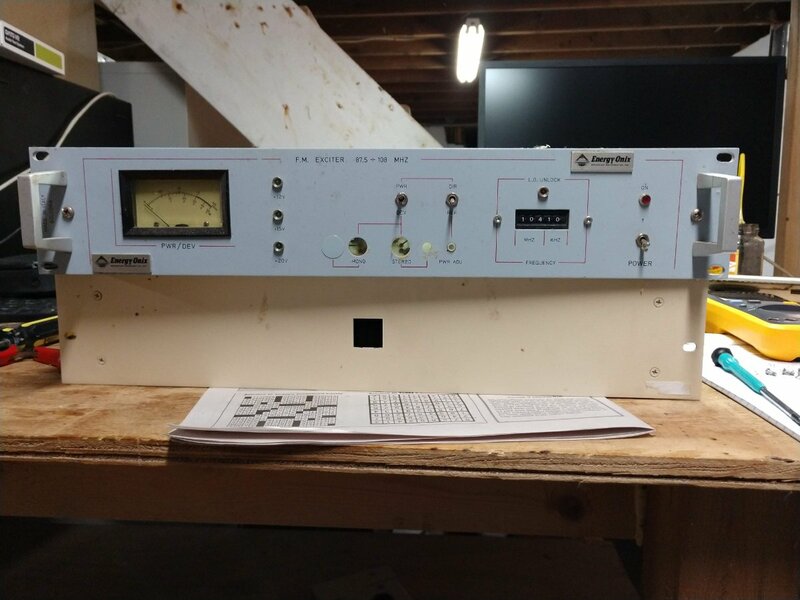 The tube is the original EMIAC 4CX15000A that came with the transmitter. I am a little nervous about turning it off to clean the cabinet. We have a spare on the shelf for the eventual replacement of this tube, but I really want to see how long this thing will last. This is also one of the last tube transmitters we have in main service. There are several backup tube transmitters still around. Overall, I would say that this transmitter has been very reliable. 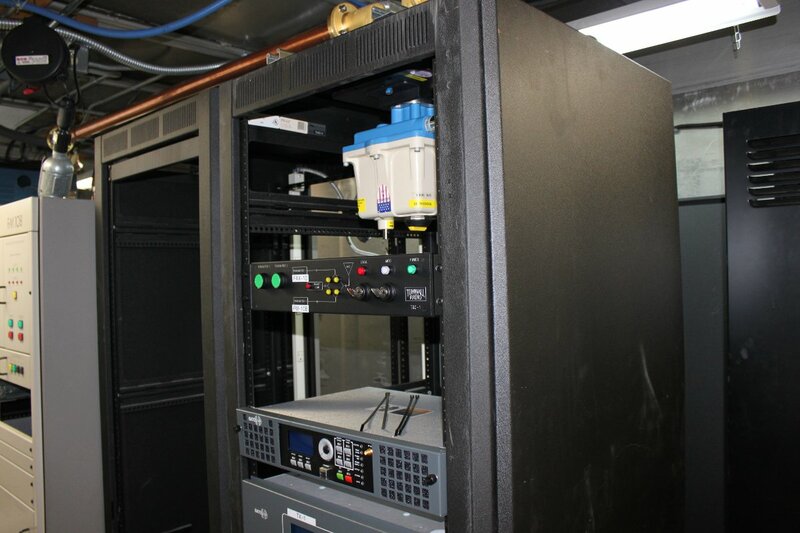 We had to install a UPS for the exciter and HD Radio exporter, but that is not a big deal. During the first power outage, the exciter went dark first. It took longer for the transmitter controller board to lose power, in the interim the controller turned the transmitter power all the way up. When the generator came on line 10 seconds later, the transmitter returned to operation at 41.5 KW. This, in turn, caused one of the other field engineers to freak out and nearly lose his mind (stay away from the brown acid, FYI). I installed the UPS a few days later. 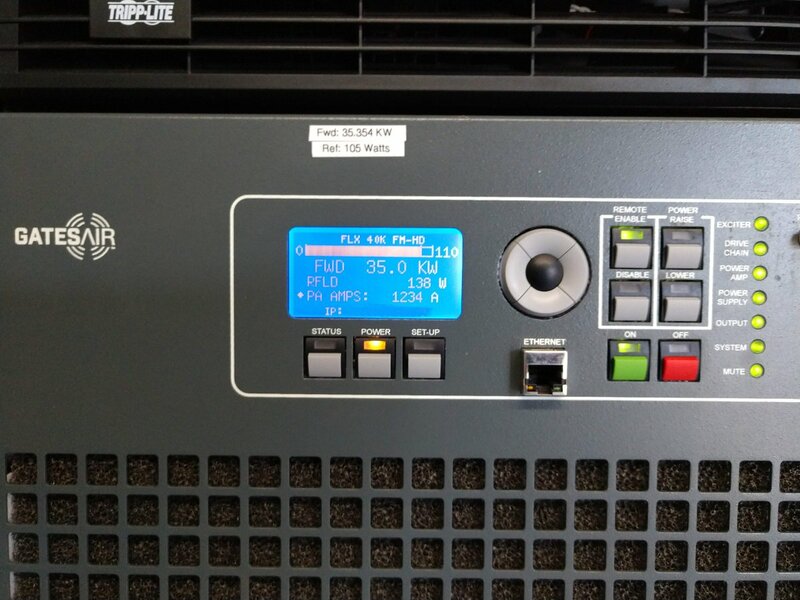 Transmitter power output is 35.3 KW, which is getting into the semi-serious range. 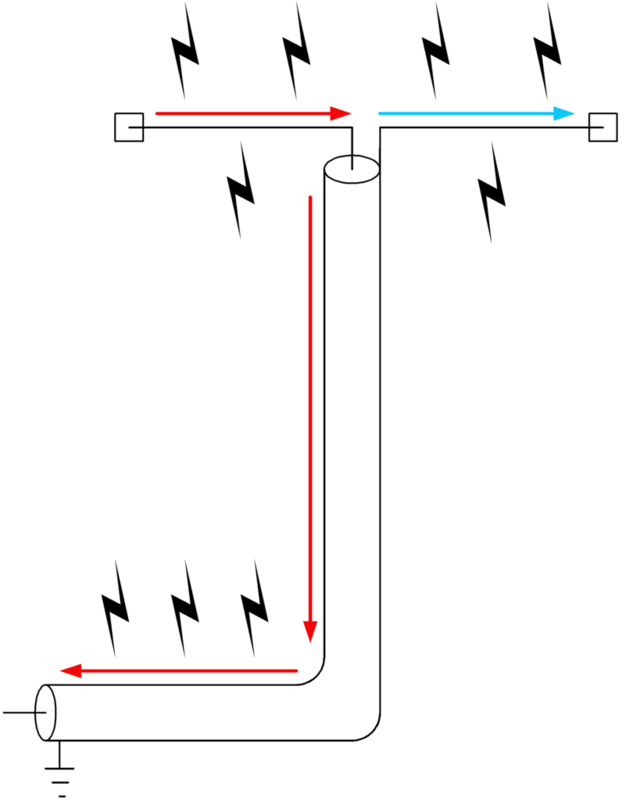 The reflected power goes up when it gets warm out and goes down in colder weather. Over the winter, it was running about 50 watts. 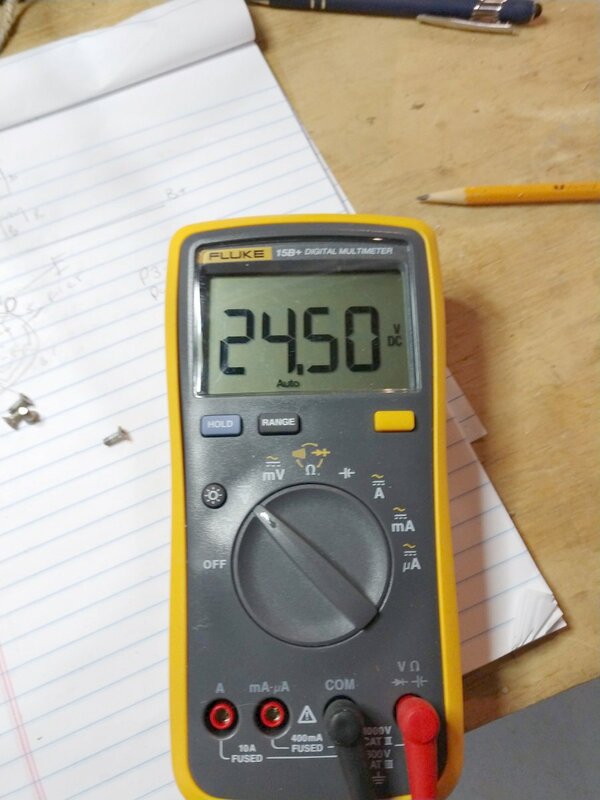 Even at 138 watts, that represents 0.004% reflected power. The TPO forward goes to the 6 bay, 1/2 wave spaced antenna side mounted, 470 feet (143 meters) AGL. The station covers pretty well. Overall, I would give the liquid cooling system an A grade. 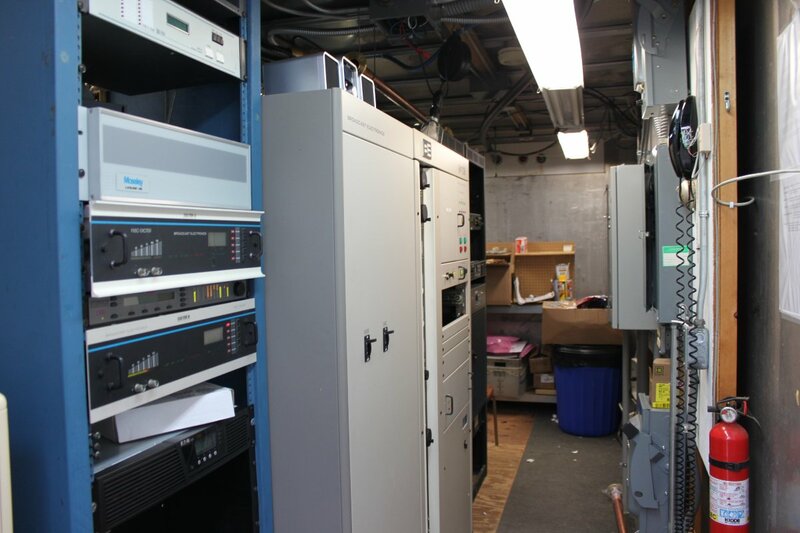 The transmitter still dumps a fair amount of heat into the room from the RF combiners and PA power supplies. Most of the heat, however, ends up outdoors. 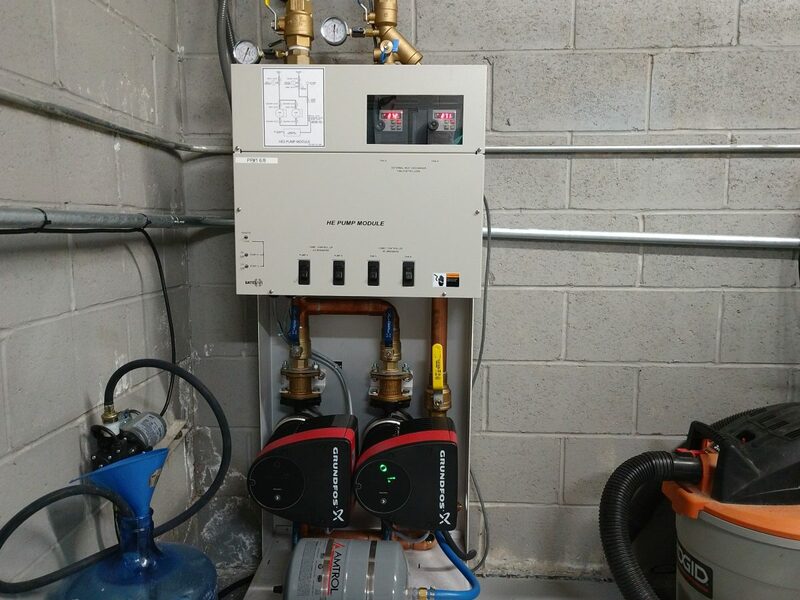 Previously, we had two Bard 5 ton AC units running almost full time. Now, only one AC unit cycles on and off except for the hottest days of the year. Outside temperature when this picture was taken was 81 degrees F (27.2 C). Next year, we will have to send a sample of the coolant off to be analyzed. I have had good experiences with the GatesAir FLX/FAX series transmitters. I would recommend this to a friend. 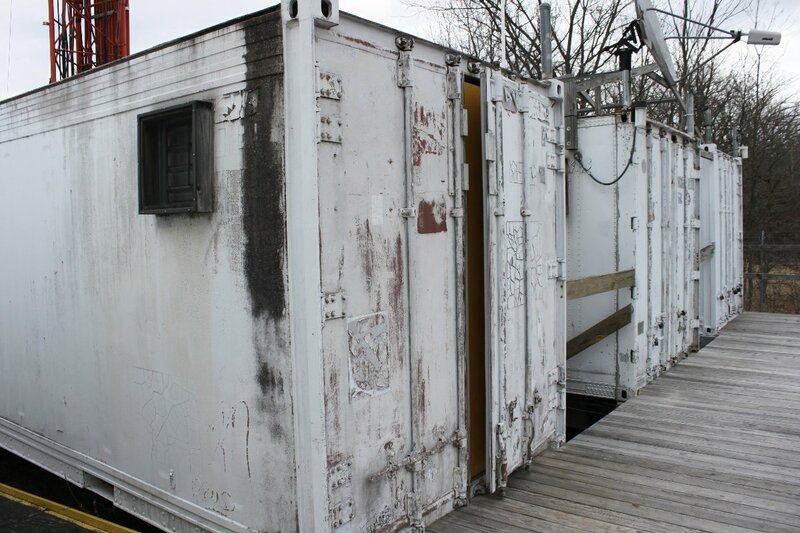 Shipping container transmitter site from the early 1990’s. Air conditioning. Using a traditional Bard type equipment shelter HVAC unit requires cutting through a lot of fairly heavy gauge steel. What’s more, the steel walls are uneven, requiring filler. They are by necessity, fairly narrow. Arranging racks and transmitters along the length of the unit restricts access to either the front or the back of the equipment. 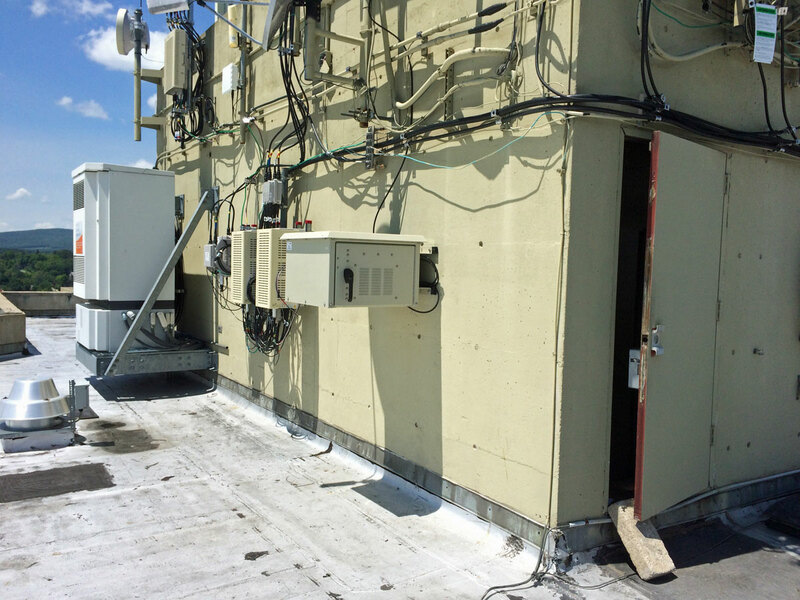 Meeting NEC clearance requirements for electrical panels, transfer switches and disconnects can pose problems. They are not very tall. Mounting overhead equipment can be problematic as one does not want to drill through the top of the container. Crosswise unistrut is one solution, but it lowers the overhead considerably. Electrical work is slightly more dangerous. 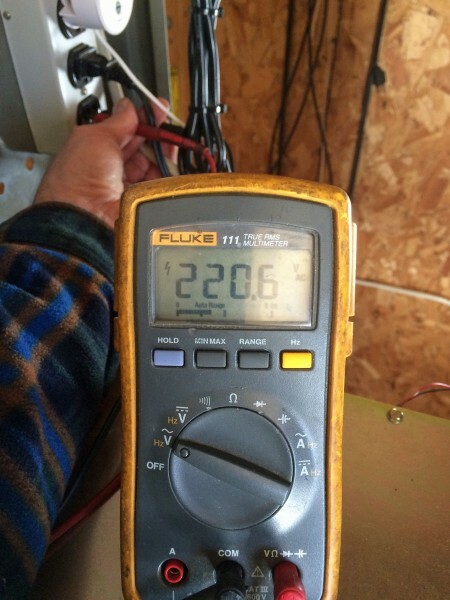 Doing any kind of electrical work, trouble shooting, repairs, etc is a little more nerve-racking when everywhere around you is a metal surface at ground potential. They are difficult to insulate against cold and heat. The door latching mechanisms bind, wear out or otherwise fail over time. All of those things being said, I am now rebuilding a transmitter site in one of these shipping containers. Fortunately, the original electrical work was not bad. 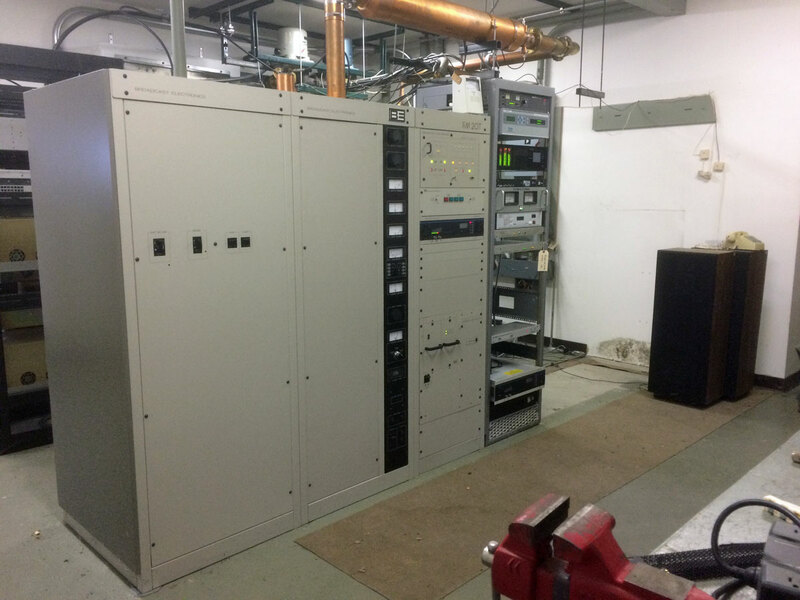 The transmitter is a twenty year old BE FM10B, which will be retained as a backup. The new transmitter is a Gates Air FAX-10. We have installed several of these Gates Air transmitters in the last two years or so and they seem to be pretty solid units. This is the second 10KW unit I have installed. 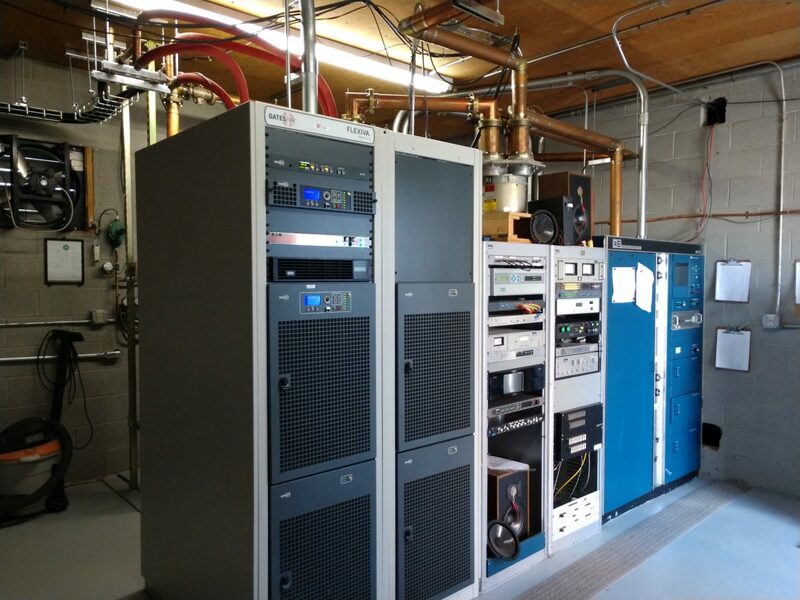 We decided to install the FAX-10 in a Middle Atlantic rack, since we did not have a whole bunch of extra room for a separate transmitter rack. The 1 5/8 inch coax switch is installed in the top of the transmitter rack along with a Tunwall TRC-1 switch control unit. The other rack will have the STL and all other ancillary gear. My idea is to have nothing in between the door and the FM10B so it can be easily removed when that day comes. Something, something about planning ahead since it will be likely myself removing the FM10B. 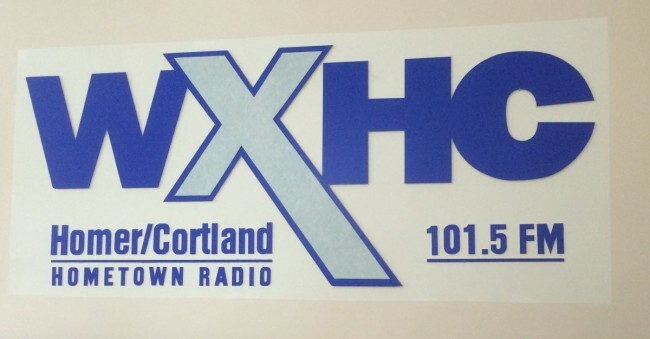 WXHC in Homer, New York will never be listed on the NY Stock Exchange. Is that bad? They don’t think so. 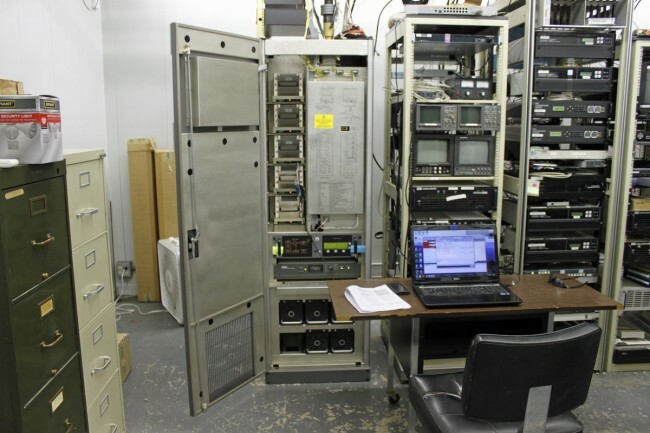 A small class A FM station, one of many that signed on in the early 1990’s as part of the 80-90 drop ins (FCC docket 80-90, for those unfamiliar). Many of these stations did not fair too well and ended up being absorbed by larger stations and groups starting with the first wave of ownership deregulation in 1993. WHXC has remained under the same ownership since it signed on in 1991. Eves Broadcasting is a family operation, employing maybe half a dozen people. Their studios and offices are on the third floor of the Bank of Niagara right in the center of town. The facility is very nice. Like any successful radio station, their focus is the community they serve. The format is “Oldies” but they also broadcast high school football, Syracuse sports and so on. They host a yearly Blue Grass festival on the village green. The air studio has an Arrakis console and uses BSI Simian automation software. They have live DJ’s from 6am to 6pm, local news, weather, sports, etc. 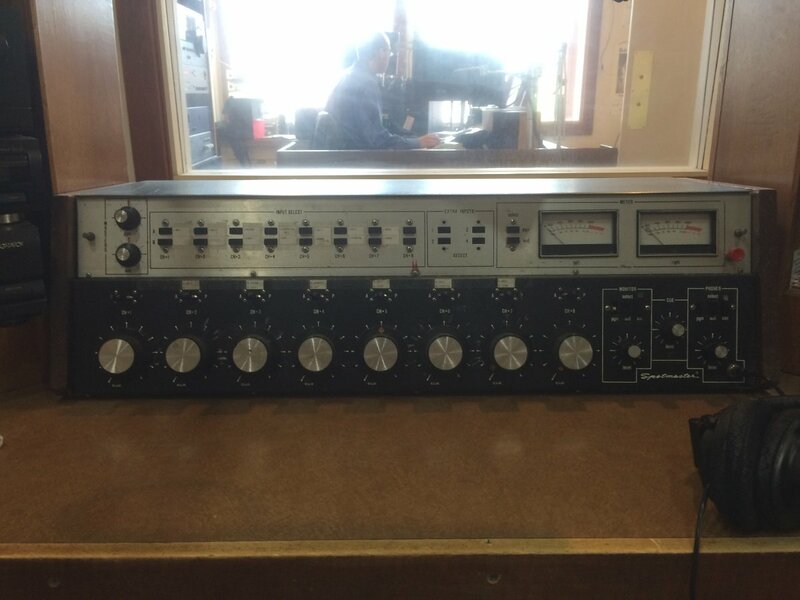 The production room has a BE Spotmaster 8S200A console from 1978. Aside from needing some power supply capacitors, it still works relatively well. However, as the owner’s son said; that thing belongs in a museum. BE Spotmaster line input card. Probably can still get all these parts if we wanted to. I forgot to take pictures of the transmitter site when I was there. Next time. We will be working on several projects for these folks, so I will keep you posted on the progress. We have been poking away at this one for the last year or so. It seems that the previous owners of Berkshire Broadcasting had filed for a translator to rebroadcast WNMB, (100.1 WUPE-FM) North Adams in downtown Pittsfield, during the great translator rush of 2003. When the CP showed up in the mail last March, the current owners were quite surprised. 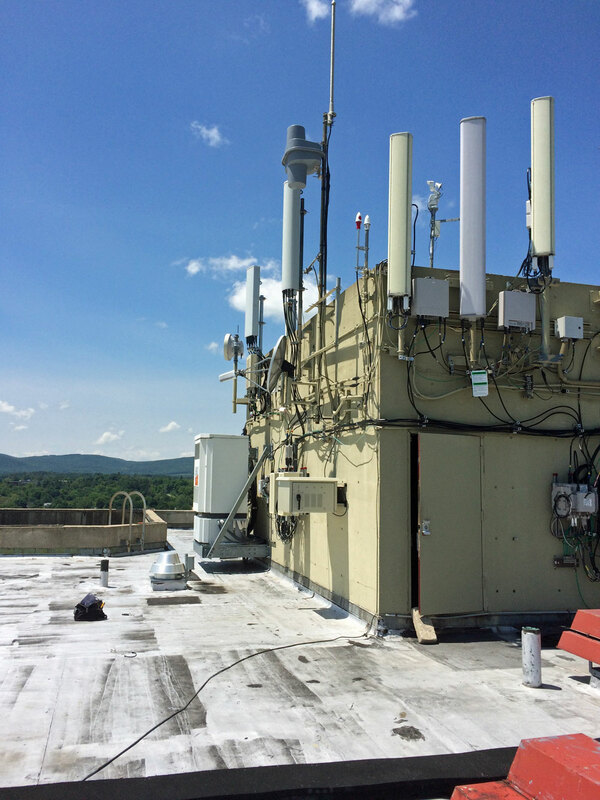 Moved the transmitter location from 100 North Street to 1 West Street (Crowne Plaza Hotel) which is the tallest building in Pittsfield. Antenna AGL is 44 meters (145 feet). We were able to make those antenna and power changes because we changed the parent station to the local AM station, WUPE, 1,110 KHz. The previous power/pattern was submitted to keep the translator signal within the 60 dBu contour of the FM station in North Adams. This, I feel, is the best use for an AM to FM translator. WUPE-AM is a class D station with no night time service. Adding a night time service greatly increases the station’s value to the community. 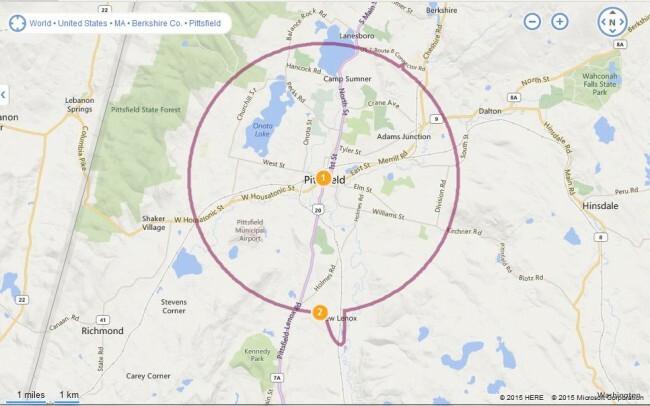 While the 100 Watt translator does not cover near as much as the 5,000 watt AM station, the transmitter location is right in the center of Pittsfield, so coverage of the population center is excellent. The view from the top of the Crowne Plaza is quite spectacular. I am pretty sure I will have a lot of transmitter maintenance to do right about the middle of October. The outdoor enclosure is a DDB POD-16DXC which is rather nice, it comes with rack rails and a thermostatic controlled fan. The antenna is a Shively 6812B with RADOMES. The transmitter is a BW Broadcast TX600v2. I really like these transmitters, they are well designed and rugged. We have yet to have a single failure of one of these units in the field. The station ERP is 100 watts, so a small bit of calculating is required to arrive at the proper station TPO. I find it easier to make all these calculations in the decibels per milliwatt (dBm) unit domain, then convert back to watts. Thus, the ERP is 100 watts, or 50 dBm. The antenna has a gain of -3.4 dBm. We used 25 feet of LMR-400, which at 103.3 MHz, has a loss of -0.26 dBm. The total losses are -3.66 dBm, making the necessary TPO 53.66 dBm, 232.27 watts or rounding down to 232 watts. The original V series Nautel transmitters have required a couple of firmware upgrades in some cases. The first was for the controller to add a little bit of bias to the PAs during analog operation. The second one I have had to do is to the PA modules themselves which was to keep the power supplies from shutting off during re-transfer from Generator power to commercial power. I have done several of these and once you get the hang of it, it only takes a few minutes to complete. Still, I remember when transmitters didn’t have firmware. The low voltage control circuits were either 120 or 240 VAC with big relays and contactors that loudly confirmed their closure before any meters began to move. Regarding Nautel transmitters in general; the newer models are not same rugged, reliable designs that were common in the past. We have AM ND series transmitters that have been on the air for 20 years without a single failure. The models rolling out of the factory these days often have switching power supplies fail without reason or warning and RF pallets that are fragile things. Ah well, I suppose all things are cyclical. That is a very old FM broadcast antenna from 1947-48. It must have been intended as a spare antenna in case the main antenna had a problem. It was never needed, so it remains in its original shipping crate. I would think that these were rather well made, since the original main antenna was in service from 1948 until 1970 or so, when it was replaced with a Shively 6710. The entire antenna is intact including the interbay lines, power divider T’s and tuning section. Of course, it is of little use to the radio station today, as it is horizontally polarized. Perhaps some museum somewhere? I don’t know, it would be kind of neat to put it all together and use it as an exhibit. 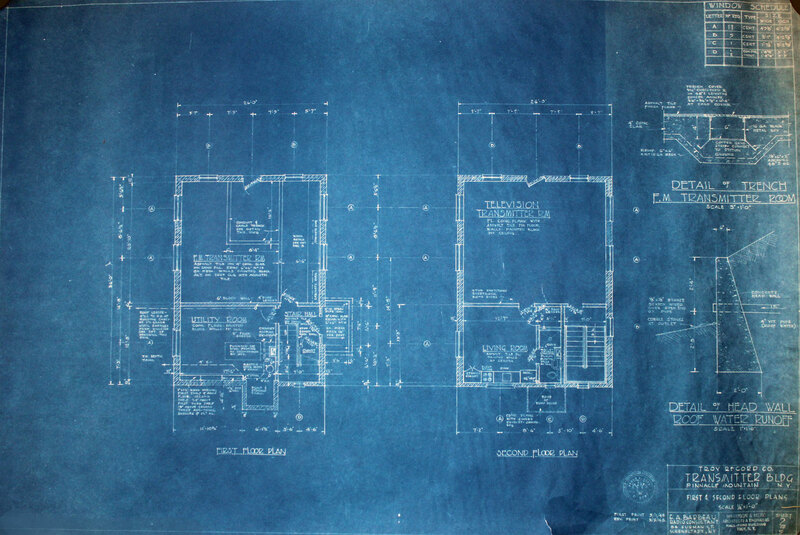 Update and bump: I hate to rehash old stuff, but I added quite a bit of information to this post, including .pdfs of all the Barbeau letters, blue prints, etc. I’ve been doing quite a bit of work at this site lately, so it is in the front of my mind. I have also been reading about the Rural Radio Network, which covered western and central New York. Several years ago, I rescued a old filing cabinet that was being trashed. This particular file cabinet was moved to a transmitter site during the great radio consolidation of the late 90’s and early 00’s. In it, I discovered a treasure trove of early documents about two radio stations from the Albany NY area. I thought it would be interesting to document the building of one of the early FM stations in Albany, WFLY. GE owned W2XOY on 48.5 MHz (circa 1939), later W85A, WGFM, and WRVE 99.5 MHz. Independently owned W47A on 44.7 MHz (circa 1940), later WBCA 101.1 MHz, now gone. Troy Record owned WFLY on 92.3 MHz (circa 1948). 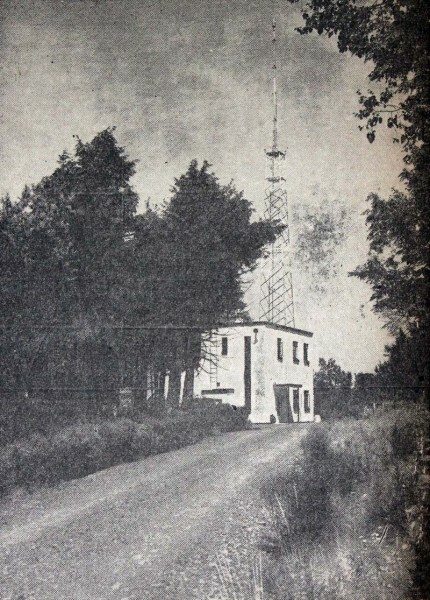 These stations operated from transmitter sites in the Helderberg escarpment on land that was formerly owned by the Albany Bible Institute. It is interesting to note that two of the four FM stations did not make it past 1955. In 1967, WTRY did make a second attempt at FM, launching WDKC on 106.5 MHz, which is today known as WPYX. It would appear the Troy Record initially applied for an FM broadcasting license in late 1946. 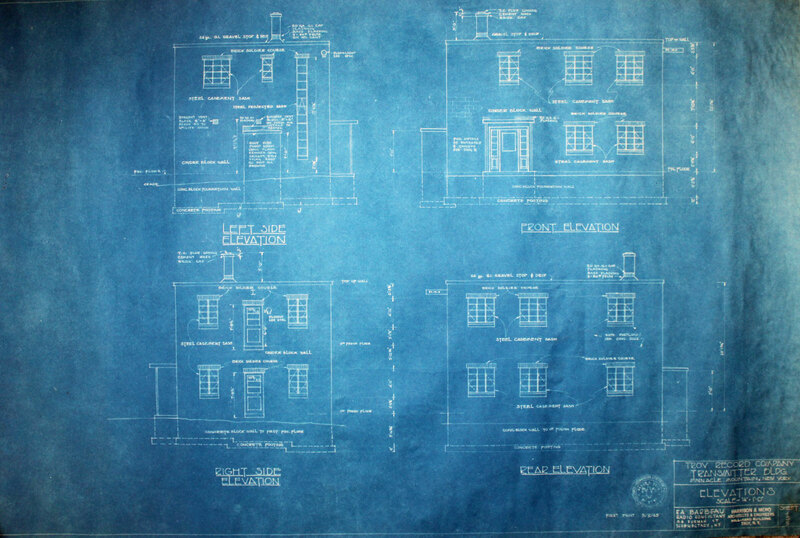 The paper trail that I have starts in early 1947, when the station hired consulting engineer Ernest Barbeau of Schenectady to oversee the construction process for the studios and transmitter site. Ernest Barbeau, in an introductory letter to Frank York, publisher of the Troy Record, notes himself as a former GE engineer and assistant to W.R.G. Baker, General Electric’s television pioneer. At the time, it was already understood the height means almost everything in FM broadcasting. There are several letters dealing with land acquisition and transmitter building construction. This is a treasure trove of information on how this, and perhaps other early FM and TV stations went about finding land and building remote transmitter sites. Remember that before this, AM transmitters could be placed in any convenient location with enough space for the tower and ground system. The line of sight nature of VHF required high locations, which in the Northeastern US, means prominent hills or mountains. Sadly, this paper trail goes away in 1948. Washington DC consulting engineer for the project is John Barrons, who at one point suggests a different transmitter location closer to the city of Troy. Barbeau insists that the Helderberg location is best because the GE engineers chose it for their FM and TV experiments. 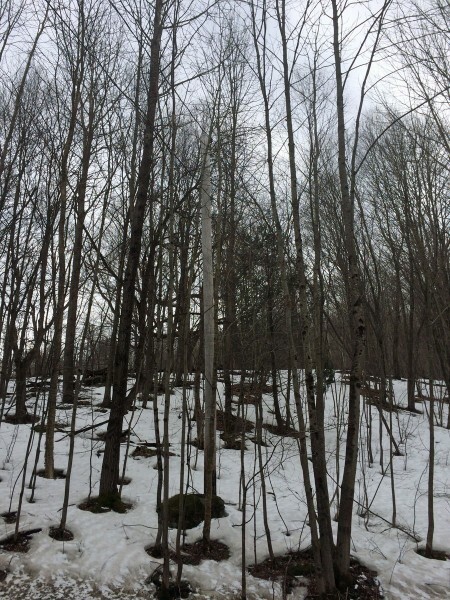 Negotiations with several land owners along the edge of the Helderberg escarpment are finally successful, with a 10 acre parcel of land purchased from Mr. La Grange, noted as being across Camp Pinnacle Road to the south of the WBCA transmitter and adjacent to the west of the GE parcel, cost $2,000. From this, I surmise the former W47A/WBCA site stood where the former WHMT/WVCR site stands today. Land survey completed by Mr. J. Kempf of Albany. The FCC application is completed with new transmitter location, antenna height and frequency of 92.5 MHz (this was changed to 92.3 MHz prior to sign on). 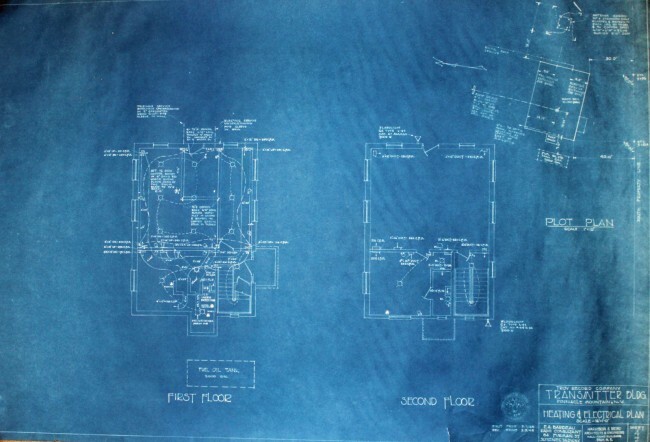 At one point, Barbeau tried to hire Walter Watson, an RPI architecture student, to draw up the studio floor plan, paying him $15.00. At first Watson agrees, then backs out of the deal. Frank York hires an architect to draw the studio floor plan and the transmitter site building plan. 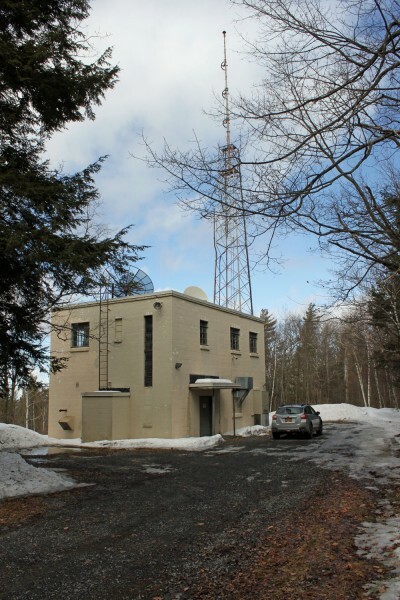 Once the plot of land for the transmitter site is purchased, several different building locations and antenna configurations are discussed. It is noted that both WBCA’s and WGFM’s original antenna was mounted on a pole at ground level. The later station was moved to a makeshift tower. 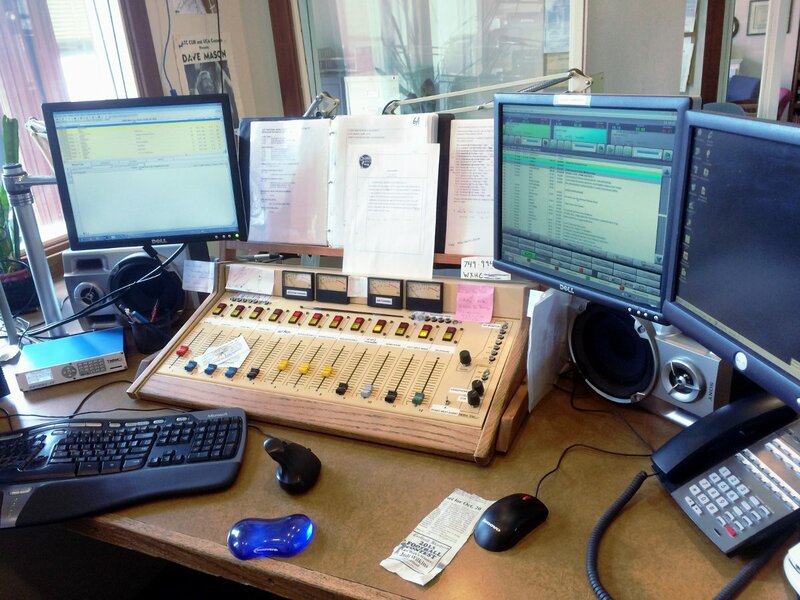 WBCA management raises concern with the FCC about potential interference from the new station’s transmitter and potential STL, noted as an S-T link. In September of 1947, Frank York expresses some concern with viability of project, Barbeau sends several “pep talk” letters saying that FM radio is the future of broadcasting. The building site is chosen, land cleared, access road installed, work done by Orsini Brothers Construction from Altamont, clearing and road work cost $2,000. The call letters WFLY are chosen, they are the initials of Frank Lloyd York. An 80 foot Blaw-Knox self supporting tower is purchased and installed by Zane Construction, cost of tower is $1,700 installation was another $200.00. Well is drilled by Stewart Brothers well drilling from Guilderland, cost of $5.90 per foot drilled, total cost unknown. Transmitter building work began, building is noted as a two story, concrete block construction, work done by Orsini Brothers. A GE BY-4-C four bay circularly horizontally polarized antenna and 3 1/2 inch Andrew transmission line is installed on tower. Building construction progresses, telephone and electric service installed. 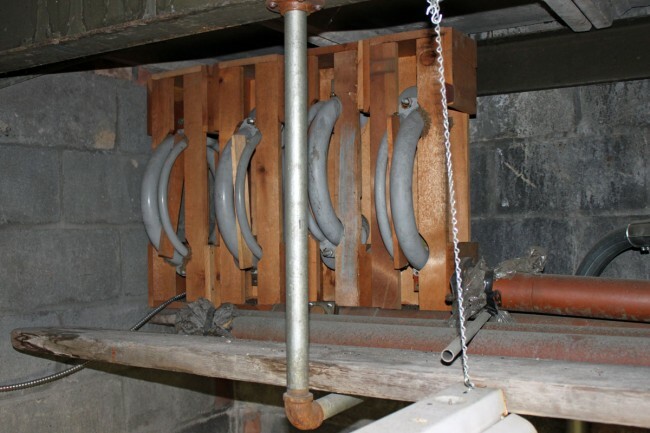 Three phase electrical service cost $2,100 from New York Power and Light. Studio site chosen in at the Troy Hotel in downtown Troy. Living quarters constructed on second floor of building for full time transmitter engineer. A GE BF-3A 3 KW FM transmitter purchased and shipped. Telephone circuits between new studio installed and tested. In addition to the construction, there was quite a bit difficulty from the WBCA management, who were concerned about possible interference. 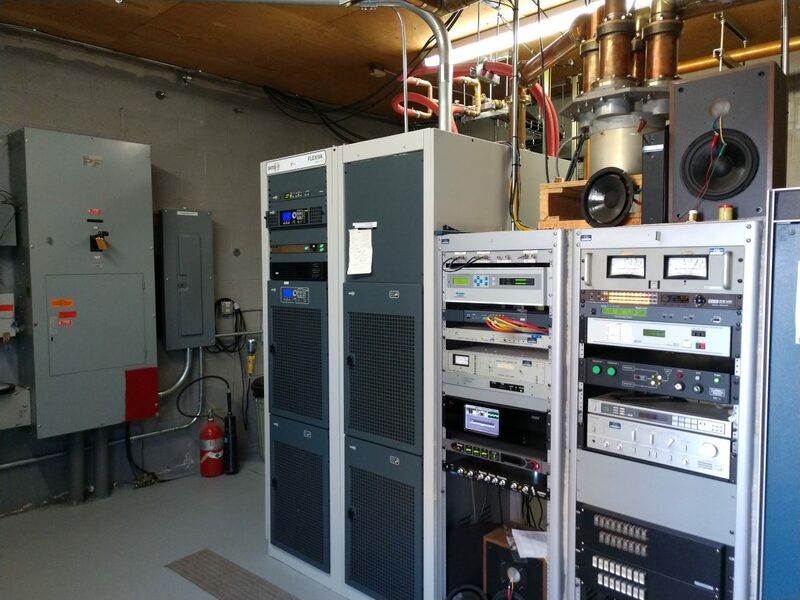 WBCA was part of the “Continental Network” and received most of it’s network programing via direct over the air relay from W2XMN/W31NY, 43.1 MHz, in Alpine, NJ. They complained to the FCC about potential interference on both their over air network relay (43.1 MHz) and the Studio to Transmitter Link from downtown Schenectady on 950 MHz. In the end, the FCC was unimpressed with these arguments and granted WFLY its operating license. These mountain top transmitter sites did not exist prior to the advent of TV and FM. The amount of planing and work went into launching this station is quite impressive. For the early FM radio stations, this type of effort and expense was probably typical. Equipment rack outlet with 220 Volts to ground. It seems the power company has some work to do. The other leg measures 28 volts to ground, which to me means the Neutral has been lost somewhere. Fortunately, the transmitter was running on 240, which looks normal on the voltmeter. Everything in the rack; the remote control, exciter, STL, etc has been damaged or destroyed. That is the power and phone line in those trees, as it leaves the road and travels approximately 1,700 feet through the woods. It is a private line and the utility will not do any work until the trees are cleared away. In all fairness to the current owners, who have owned the station for not quite a year, this situation has been like this for a long time.